Do you enjoy swimming? Going to the pool can be a great way to exercise or socialize. The pool can also be a great place to do rehabilitation. Aquatic rehab is a great way to get someone walking better after an injury or to decrease your risk of falls, or to help your shoulder feel better. 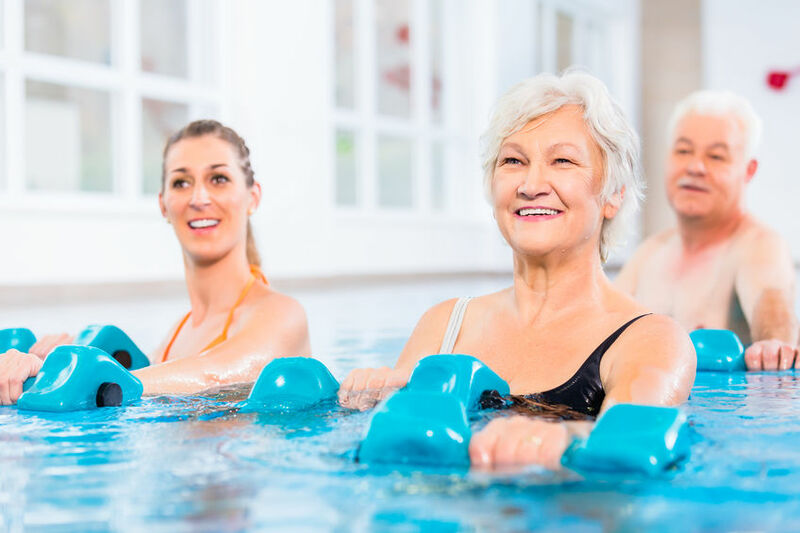 Cardiac Rehab: Hydrotherapy allows for greater amounts of blood to return to your heart from your arms and legs which allow you to have a greater cardiovascular workout at lower exercise intensities. Hydrotherapy should not be used for severe heart failure or after a recent heart attack. Respiratory Rehab: The effect that water has on the respiratory system increases the amount of work that it takes to breathe due to the gentle compression of the water on the chest wall. This allows you to strengthen your breathing muscles when doing hydrotherapy. Musculoskeletal Rehab: Hydrotherapy can help decrease pain and swelling after an injury. Also, hydrotherapy can be used to do whole body exercises when you are unable to fully weight bear or when recovering from a spinal injury. Water also can be used as a resistance to build muscle strength and endurance. Athletic Rehab: As mentioned above, hydrotherapy helps to strengthen your breathing muscles, but it also can help improve your muscle endurance, which can decrease the chance to fatiguing during athletic competition. Also, doing water running can help improve maximal aerobic capacity, especially if you aren’t able to train to your full capability on dry land. Arthritis: Hydrotherapy can help your joints feel better and be less swollen. Also, doing a gentle range of motion exercises in the water can help improve your level of pain and range of motion. Geriatrics: Hydrotherapy can be great for improving your balance because you can do higher level balance exercises without the risk of injury from a fall. Balance training is very important to decrease the risk of having a fall. Hydrotherapy can be a great way to have fun while recovering from an injury. There is also good research to support its use in many different rehabilitation situations.